Sitting on the steps of a colonial-era parish church in Dolores Hidalgo, a town in Mexico’s state of Guanajuato, a group of Ohio University students spent part of a beautiful March afternoon pondering what happened on that very spot nearly 210 years earlier. There, on Sept. 16, 1810, the parish’s priest, Father Miguel Hidalgo y Costilla, called on his parishioners and the region’s poor to take up arms against the colony’s Spanish overlords. His insurgent army soon swelled into the thousands, then tens of thousands, as it stormed through Guanajuato and headed toward the outskirts of Mexico City, where it eventually stalled. Months later, Spanish loyalists defeated Hidalgo’s army and executed the priest in July 1811. OHIO Experiential-learning students and Father Miguel Hidalgo y Costilla’s church in the town of Dolores Hidalgo, Guanajuato. 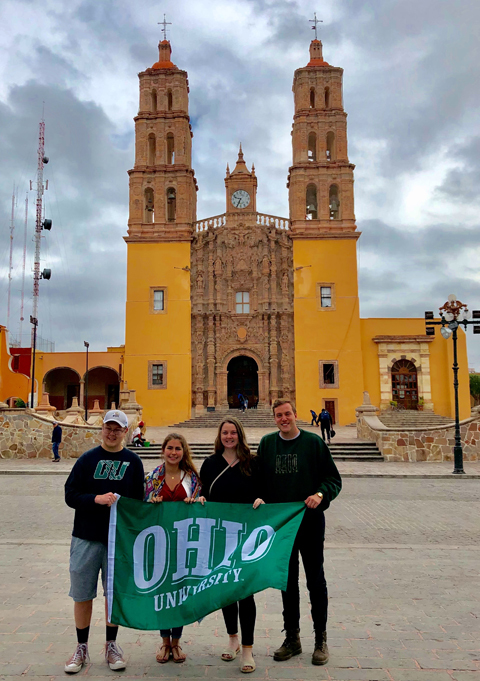 Having logged two months of reading about and discussing the roots of Hidalgo’s rebellion and the long and winding path of Mexico’s separation from Spain, students enrolled in the experiential-learning course taught by Dr. Patrick Barr-Melej, Professor of Latin American History, traveled to the state of Guanajuato—Mexico’s “cradle of independence”—during spring break with Barr-Melej, program co-director Dr. Marlene De La Cruz-Guzmán, director of the Office of Multicultural Student Access and Retention, and Brian Waldron of CISabroad. The course was coordinated through the Office of Global Opportunities and CISabroad. Students explored the colorful city of Guanajuato, the state’s capital, for four days, visiting pivotal sites in Mexico’s late-colonial and independence-era history, including the location of a massacre of Spanish loyalists at the hands of Hidalgo’s insurgent peasants (and where Spanish loyalists later displayed Hidalgo’s severed head for 10 years). The group then explored the city of San Miguel de Allende, also a key destination of Hidalgo’s army and the birthplace of one of Hidalgo’s principal associates, Ignacio Allende. The trip ended in Dolores Hidalgo, where student’s visited Hidalgo’s church and toured other sites. Needless to say, the group also ate very well and enjoyed the warmth and hospitality of Guanajuato’s people.